It is common for cat owners to be concerned because their cat is not eating and cats are well-known for being fussy eaters. It is more unusual for cats to eat excessively. If your cat seems to have developed an appetite that cannot be satisfied, it could be a sign of a health condition. This is something that you should talk to your vet about. The medical term for a cat being hungry all the time is polyphagia. Typically, owners notice that their cat is eating very quickly and can vomit after they eat. They may beg for food and continually surf the kitchen on the lookout for scraps. They may suddenly start eating foods that they previously refused and may steal food from other pets. Perhaps your cat is simply not getting the nutrition that they need from their food. Observe them closely when they are eating. Are they struggling to chew or swallow the food? 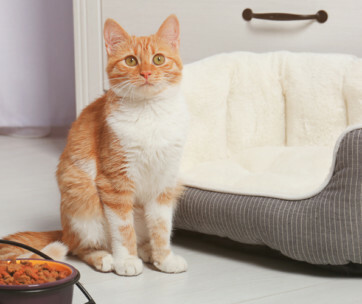 When cats cannot cope with dry food, it may help to switch them onto a wet food diet. 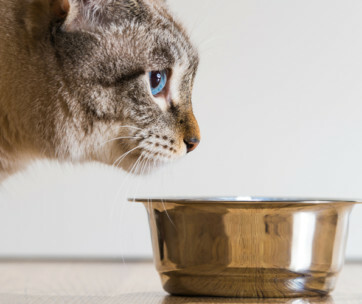 As cats get older, wet food may suit them better, especially if they have dental problems. High quality cat foods contain plenty of protein and fiber that keep your cat satisfied for longer. Cheaper foods tend to have fillers which are digested quickly and your cat soon feels hungry again. If your cat is not getting the nutrition that they need from their diet, they may start to eat unusual substances such as cat litter. Roundworms are parasites that are common in cats. They live in the intestine and they can exist because they steal the nutrients from the cat’s food. This leaves the poor cat feeling hungry all the time. Your vet will be able to advise on treatment. Cats get diabetes for the same reason as humans. Their pancreas is not producing sufficient quantities of a hormone called insulin. This hormone is responsible for controlling the amount of glucose (sugar) in the blood. Cats with diabetes can feel hungry all the time. This is a hormonal disorder that affects the endocrine glands. Too much growth hormone is produced by the pituitary gland and this triggers constant hunger. This is another condition that affects the pancreas. This time, the pancreas is not able to produce enough digestive enzyme to break down the food that the cat is eating. Therefore, the food passes through the body and the cat can’t get the nutrition that they need from it. This can cause a range of symptoms which may include chronic vomiting and chronic diarrhea. Both are likely to result in your cat feeling hungry all the time. It is caused by an inflammatory response in the cells of the intestinal tract. Because your cat is deriving little nutritional benefit from their food, they always feel hungry. You can get special food that will help with this condition. It is often labeled as a gastrointestinal diet. If your cat has already been diagnosed with cancer, your vet will advise you of what to expect in terms of their appetite. A loss of appetite is more common in this disease. However, in the early stages of some cancers, the tumor can interfere with the production of insulin and growth hormone and this can stop the nutrients from being absorbed and leave your kitty feeling hungry. Gastrointestinal cancers, including adenocarcinoma and leiomyosarcoma, interferes with the absorption of nutrients and increases hunger. There are some medications that increase a cat’s appetite and steroids are the most common. This is something that you need to discuss with your vet. They may recommend a change of diet or a change of medication. The thyroid gland is found in the neck and controls how fast the metabolism is. It does this by producing a hormone called thyroxine. When too much thyroxine is produced, a condition called hyperthyroidism is the result. The metabolism speeds up, the chemical reactions in the cells speed up and the body needs more nutrients. This causes an increase in appetite. Sometimes an increase in appetite can be put down to pure boredom. It could also be caused by behavioral issues including anxiety and depression. If your cat is fussing around and looking for treats all the time, this could be the cause. You can help this by providing appropriate stimulation in the form of cat toys. How much food your cat is eating. The calorie content of the food. This will be on the label. 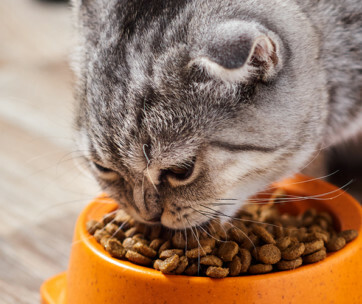 How long your cat has been eating this food. When the change in your cat’s eating habits happened. Any other symptoms such as vomiting or diarrhea, excessive thirst, problems passing pee or poop. Any changes to your cat’s appearance including any lumps or bumps. Any changes to your cat’s behavior including anxiety, depression, aggression. Any changes in the home that could have caused anxiety such as a house move or a new pet. Your vet will carry out a thorough physical examination and may arrange some blood tests or other tests to check for roundworms etc. They may also need to perform an x-ray or ultrasound of the internal organs. Once the diagnosis has been made, they will arrange appropriate treatment. If they have ruled out all possible causes then it may simply be a matter of a poor diet. By switching to a better quality formulation, you should soon notice a change for the better.